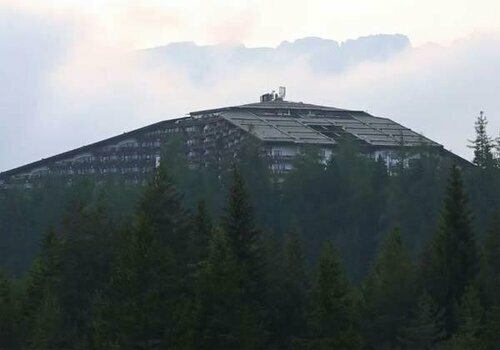 The 63rd Bilderberg conference was held on 11 - 14 June 2015 in Telfs-Buchen located in the Austrian Alps. It took place right after the G7 Bavaria summit (June 7-8) and the Fifth Congress of Leaders of World and Traditional Religions in Astana (June 10-11). The global governance and new challenges, the realization by people with rational thinking of the fact that humanity faces negative implications and real threats posed by the criminal policy of ruling circles – these issues hit the agenda to be viewed at different angles of view and discussed at all levels of representation. The G7 concentrated on fighting terrorism, including the Islamic State, the relationship with Russia, financial markets (the heads of World Bank and International Monetary Banks were among the participants), the strengthening of World Trade Organization, the creation of US-EU economic association, tax evasion, Ebola virus and global ecological situation. The Astana ecumenical meeting was devoted to establishing peace on the basis of «global ethics». It stressed the importance of dialogue between religious and political leaders «to bring peace, security and harmony». It’s worth to note that in Astana the final declaration was read by Jean-Louis Pierre Tauran, a French cardinal of the Catholic Church and the President of the Pontifical Council for Interreligious Dialogue in the Roman Curia, not UN Secretary General Ban Ki-moon or Secretary General of the Organization for Security and Cooperation in Europe (OSCE) Lamberto Zannier. These issues are discussed publicly. As usually the real instruments of exercising global control were considered behind closed doors in Telfs-Buchen. There were tough measures taken to prevent information from leaking. Checkpoints were installed on the venues leading to the hotel. 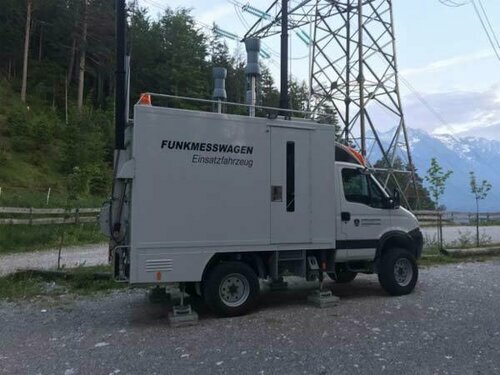 Military-grade security measures included new equipment to suppress cell phone communications, no matter the use of such devices is forbidden by European Commission Directive 1999/5/EC. Everyone who entered the security zone to be detained by police had to pay a 500 euros fine or spend two weeks in jail. As a result, no information was available about the event, except the list of participants and the formally announced agenda. Normally the Bilderberg Club discussions are never made public. Media did not highlight the event. As usual, several hand-picked, influential journalists and prominent media figures were invited to this year’s meeting, but against journalistic standards they were strictly forbidden from revealing anything discussed during the event.This year’s attendees list included: Canadian journalist and National Post editor Andrew Coyne, former Economist Editor-in-Chief John Micklethwait, who now heads up former New York City Mayor Michael Bloomberg’s eponymous news outlet, Editor-in-Chief Economist Zanny Minton Beddoes. Beddoes previously worked as an economist at the bankster International Monetary Fund loan shark operation, and is a trustee of the Carnegie Endowment for International Peace. The meeting was also attended by chief economics commentator at The Financial Times and central bank apologist Martin Wolf. Also attending the conference for the first time was former Financial Times chief executive Rona Fairhead, who recently assumed the role of chairwoman for the BBC Trust, the British Broadcasting Corporation’s «governing body», and is also a director at HSBC. Mere hours after Fairhead was appointed head of BBC Trust last year, she was sued by HSBC shareholders alleging she helped launder money for terrorists and Mexican drug cartels. As is known, American and British media are extremely monopolized. Chief editors and owners have close ties with state structures. Outlets are subject to strict censorship and function according to hard and fast rules. The ideas espoused at the meeting will be imperceptibly instilled by media to influence public opinion. With all the secrecy around the event, the announced agenda and the list of attendees provide some clues to what the meeting was about. The key topics for discussion this year included: artificial intelligence, cybersecurity, chemical weapons threats, current economic issues, European strategy, globalisation, Greece, Iran, the Middle East, NATO, Russia, terrorism, the United Kingdom, the USA and the US elections. A look at the list of attendees makes think that the key items for debates were artificial intelligence, cybernetic security and current economic problems. The list of guests also included former US State Secretary Henry Kissinger, NATO Secretary General Yens Stoltenberg and heads of major banks and companies. There were three attendees representing Google: Eric Schmidt, Executive Chairman, Google Inc., Demis Hassabis, Vice President of Engineering, Google DeepMind, Regina Dugan, Vice President for Engineering, Advanced Technology and Projects, Google. Her biography shows how close Google is tied to US military industrial complex. She served as the 19th Director of the Defense Advanced Research Projects Agency - DARPA (2009-2012). 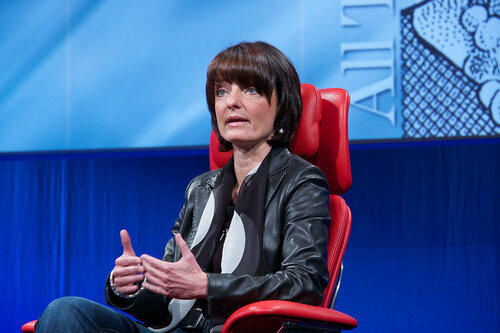 In March 2012, she left government to take an executive role at Google. Just prior to the acquisition, it was announced that she would create, and lead, the Advanced Technology and Projects (ATAP) group at Google-owned Motorola Mobility. In January 2014, Google announced the acquisition of Motorola Mobility by Lenovo but retained Dugan and her Advanced Technology and Projects (ATAP) team. Regina Dugan is known as an advocate of total surveillance. There are two things she and her team are working on - a digital tattoo and a once-daily pill, both of which would be used to authenticate you in some manner or another. The tattoo is a developmental system made by MC10. It has an antenna and some sensors embedded in it. The advanced tattoo could be used for authentication. The basic concept behind this type of tattoo isn’t all that different from the key fob you might use for work or the tap-to-pay credit card one might have. The main difference is that a person is less likely to lose his (her) tattoo. The pill has a small chip inside of it with a switch. It also has what amounts to an inside-out potato battery. When a person swallows it, the acids in the stomach serve as the electrolyte and power it up. The switch goes on and off, and it creates an 18-bit ECG-like signal in a human body and essentially the entire body becomes an authentication token. When a person touches his (or her) phone, computer, door, or car, he (or she) is authenticated in. The pill won’t be available in the near future, but it’s already received FDA clearance, which is normally a big hurdle. A person could take 30 of those a day for the rest of his (her) life. The pill has already been tested to work for authenticating a user with his or her cellphone, too. 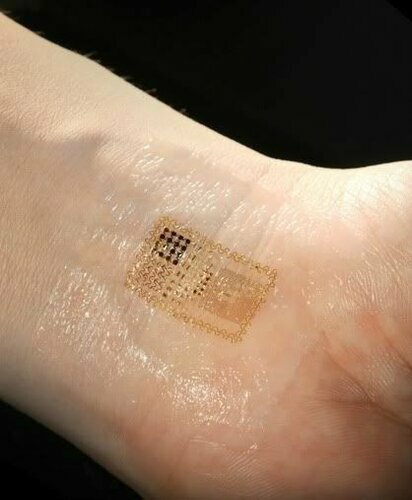 According to Dugan, Motorola is working with MC10 on a tattoo for authentication, and she has a prototype on her own arm. Dugan is also cooperating with a company called Proteus Digital Health that already has FDA clearance for an ingestible sensor as a medical device. She wants to use it for passwords, too. DARPA specializes on strategic micro systems (communications, electronic warfare, information nets security) and biological research, including gene engineering and applied neuroscience. The Agency closely cooperates with Google and NASA research center at Silicon Valley based Singularity University, the center of transhumanist thought. Transhumanism is an international cultural and intellectual movement with an eventual goal of fundamentally transforming the human condition by developing and making widely available technologies to greatly enhance human intellectual, physical, and psychological capacities. The research work is focused on developing artificial intellect – the technology of brain control. Eric Schmidt, the head of Google, never hid his plans to come up with the technology of total electronic surveillance. In his speeches he emphasizes that private life is a thing of the past. Schmidt wants Google to become a contemporary «Big Brother». The presence at the Telfs-Buchen meeting of people focused on the creation of artificial intellect and cyber security testifies to the fact that the global elite strive for drastic reform of society and bringing into life the ideas of transhumanism pretty soon. The plans envision imposing great limitations on private life and ultimately eliminating the right to privacy at all. Working on the ways to intrude into people’s lives they arbitrarily construe the very notion of privacy. Asked about thee Bilderberg’s secrecy Schmidt said it was the right to privacy. According to him, to think that such meetings cannot be held privately means to promote the ideas of totalitarianism. The 2013 Bilderberg club’s meeting showed that the forum goes through serious transformation. Having become associated with Google, the club has become kind of a Googleberg shifting its attention from other problems to mind control. Google has become a pioneer in the field of human control research. It has plans to build private cities. Lawrence "Larry" Page, an American computer scientist and internet entrepreneur, who cofounded Google Inc., says the corporation has expressed interest in constructing cities, and CEO Larry Page wants to create autonomous zones that can experiment with social rules. The idea of private cities typically invokes fears of a dystopian future where malevolent corporations ruthlessly exploit the population for profits and establish the regime of totalitarianism and pervasive surveillance. The real potential for Google and others creating private cities is in the developing world. The corporation believes that «poor countries are poor because they have predatory governments». Google thinks that these governments prevent their citizens from engaging in entrepreneurship. They also give monopoly privileges to their friends and family, enriching them at the expense of everyone else in society. These restrictions typically benefit the elite of those societies, condemning the masses to poverty. Without secure property rights and the rule of law, economic development is a pipe dream. The corporation believes it could offer hope. Because Google is worldwide and sufficiently well known, it could negotiate with developing nations’ governments for institutional autonomy to run private cities. Governments would merely need to get out of the way. This may seem like a tall order: abdicating power is rare. Luckily, it is already happening. Honduras passed a law allowing for zonas de empleo y desarrollo económico (ZEDEs), or autonomous regions. ZEDEs allow Honduras regions to opt out of civil and commercial law and import a legal system of their choosing. Further, ZEDEs are able to create their own administrative systems, allowing reprieve from corruption. Honduras is just the start. El Salvador and Costa Rica are considering creating their own autonomous regions. Whether the decision makers at Google choose to get involved is up to them. But Honduras offers a great opportunity to follow the company’s stated goals. The major instrument of electronic control is electronic money. Those who are associated with banking business openly discuss the idea of drastically curbing cash or doing away with it at all. Last year, Kenneth Rogoff of Harvard University published his report called Costs and Benefits to Phasing out Paper Currency. According to him, paper currency outlived its usefulness. He noted that it is precisely the existence of paper currency that makes it difficult for central banks to take policy interest rates much below zero, a limitation that seems to have become increasingly relevant during this century. Banning cash is also the way to do away with tax evasion and illegal activities. Striking a similar tone, former Bank of England economist Jim Leaviss penned an article for the London Telegraph published on May 13 called How to End Boom and Bust: Make Cash Illegal, in which he said a cashless society would only be achieved by «forcing everyone to spend only by electronic means from an account held at a government-run bank», which would be, «monitored, or even directly controlled by the government.» Willem Buiter, the Chief Economist at Citigroup, has recently advocated abolishing cash altogether in order to «solve the world’s central banks’ problem with negative interest rates». Experts report that, no matter the issue was current economic problems, in reality it was the possibility of doing away with cash that the Bilderberg Club focused on this time. Naturally, there is no way to know what exactly decisions were taken. Economist Martin Armstrong was the only one to report about a secret meeting to end cash that was to be held in London in late May involving representatives from the ECB and the Federal Reserve. «I find it extremely perplexing that I have been the only one to report on the secret meeting in London. Kenneth Rogoff of Harvard University, and Willem Buiter, the Chief Economist at Citigroup, will address the central banks to advocate the elimination of all cash to bring to fruition the day when you cannot buy or sell anything without government approval», wrote Armstrong. Armstrong first brought attention to the alleged meeting earlier in May when he revealed that representatives from the Federal Reserve, the ECB as well as participants from the Swiss and Danish central banks would all be attending a «major conference in London» at which Kenneth Rogoff of Harvard University, and Willem Buiter, the Chief Economist at Citigroup, would give presentations. While the world elite is providing funds for militants and pocket politicians who make the world plunge into the quagmire of wars, while the humanity is bracing up to counter viruses and epidemics invented by servants of the elite, the world rulers are consistent in their desire to create electronic governments using an integrated system of global electronic surveillance. Every man will have a constant international identification number to allow storing data on one’s private life, including the most delicate aspects, into a single data vase. Life would become totally transparent. A special electronic card would store all the needed information to serve as a multipurpose document carrying out the role of passport, driver’s license, pension and medical insurance, the means to make transactions and a travel pass etc…With a microchip installed and an electronic identity card in a pocket a man would become constantly controlled by global surveillance system. Banks, special services, the Pentagon and Google – they all pursue the same goal. They are building an electronic GULAG with no government, no national sovereignty and no personal freedom. All other things are nothing else but instruments to reach the paramount goal - absolute power.